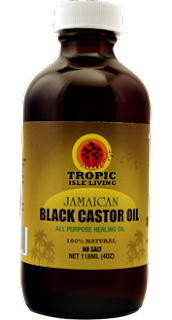 Currently, if I use castor oil at all, I use Tropic Isle Living Jamaican Black Castor Oil (JBCO) because I heard JBCO is good for the hair and scalp, and because Tropic Isle is one of the few brands that I have found to be pure JBCO without any cheap fillers. I also love that purchasing Tropic Isle's castor oil contributes to the Jamaican economy, which is where my dad is from. However, I recently started thinking about whether I need to go through the added expense of getting JBCO or if I can just use drugstore castor oil for the same benefits. My sister uses drugstore castor oil and loves it. Extra Virgin Cold-Pressed - The fresh castor seeds are pressed. This castor oil is usually pale yellow to clear, depending on whether it was filtered to lower the iodine content. Here is a Youtube video of castor beans being cold pressed - http://www.youtube.com/watch?v=sQIaPRCgU-E#t=12. Refined - The fresh castor seeds are still pressed, but then they go through a refinement process. Jamaican Black Castor Oil (JBCO) - The castor seed is roasted, beaten with a mortar, boiled and then pressed. That castor oil is usually brown to black, depending on the level of ash in the oil. Haitian Black Castor Oil (HBCO) - I did not find a ton of information on this type, but it appears to be very similar to JBCO. Chemically Extracted - In addition to all of the pressed versions, some companies use chemical solvents to extract the castor oil because it is a faster process than the press. I have heard the myth that JBCO is black because it is unrefined and has gone through less processing than cold pressed castor oil, but that is not true unless you are comparing JBCO to refined castor oil. The true difference between JBCO and cold-pressed castor oil is the ash content in JBCO, which comes from the roasting of the castor beans. The reason why JBCO is or should be considered to be better is the benefits of the ash content. The ash contains minerals, like magnesium, manganese and silica. Thus, it is believed that the higher the ash content, the better the benefits. What is your castor oil preference?